The youngest of five was Clara. And her Mother’s name was Sarah. Her siblings were ten years or older. Women’s issues they only showed her. Her brother David became ill.
Learning all his medicine with skill. She worked in the Patent Office. Wounded or in need of hospice. She had made her own adjustments. To bring supplies to the wounded. For treatments she was applauded. The fighting she was right behind. Cared for North and South combined. She was assigned to trace the fate. Her own plan she did create. Clara searched for missing soldiers. Ordered to rest is what they told her. While she was there became involved. Her issues she thought would be solved. Clara naturally was the boss. In 1865, President Abraham Lincoln placed her in charge of the search for the missing men of the Union army, and while engaged in this work she traced the fate of 30,000 men. As the war ended, she was sent to Andersonville, Georgia, to identify and mark the graves of Union soldiers buried there. This experience launched her on a nationwide campaign to identify soldiers missing during the Civil War. She published lists of names in newspapers and exchanged letters with veterans and soldiers’ families. She also delivered lectures on her war experiences, which were well received. She met Susan B. Anthony and began a long association with the suffrage movement. She also became acquainted with Frederick Douglass and became an activist for black civil rights. While on vacation in Europe she became involved with the International Red Cross and its humanitarian work during the war between France and Prussia. Created in 1864, the International Red Cross had been chartered to provide humane services to all victims during wartime under a flag of neutrality. 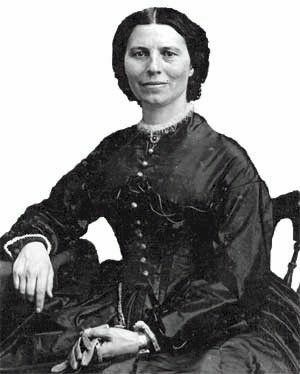 Clara Barton continued to do relief work on the battle field as an aid until well into her 70s. She went to Cuba with a cargo of supplies in 1898 and spent six weeks on the scene of the Galveston, Texas floods, at age 79. She resigned from the American Red Cross in 1904 at the age of 83 and spent her remaining years in Glen Echo, Maryland. She died in 1912 at age 91, and is buried less than a mile from her birthplace in a family plot in Oxford, Massachusetts.